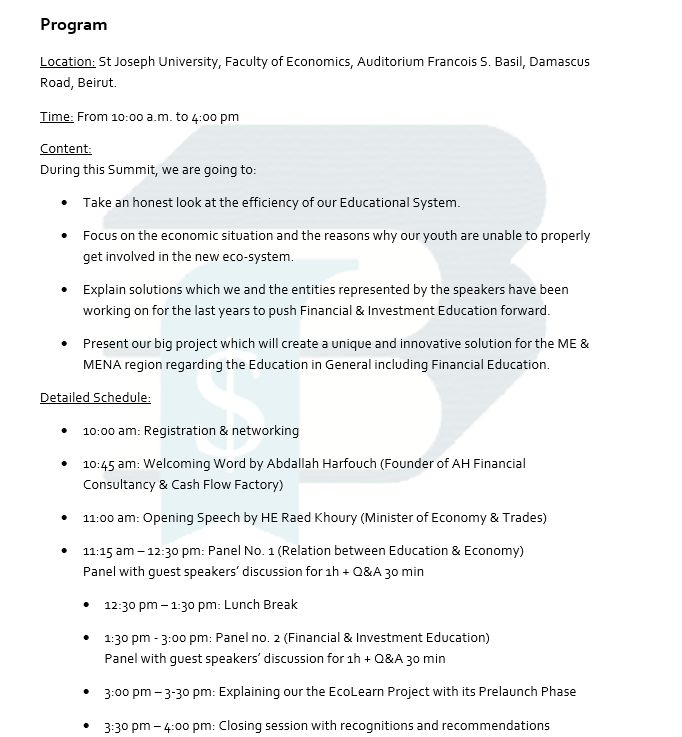 On the 17th of March, 2018, AH Financial Consultancy will launch its 1st Edition of the “EcoLearn Summit", tackling Financial & Investment education, a topic we have been working on for the last 2 years in Lebanon. The main target of this Summit is to educate and raise awareness about the importance of Financial Education and how understanding basic to advanced skills about money management could help them build a solid and secure financial future, in addition to contributing in an efficient way in the prosperity of the economy in Lebanon. We are accomplishing our goals by creating and delivering unique educational programs, followed by exceptional projects to transform knowledge into practice. We believe that hundreds and thousands of youth & adults’ futures will be saved and they will be financially secure in order to stay and invest in their mother country Lebanon. This Summit will be Limited to 250 attendees and a big part of it will be broadcasted live on our social media and Lebanese TVs that we are approaching. In this Summit, we are inviting and expecting Business People, CEOs, Founders and Co-Founders of multiple educational and training centers, as well as college & university students, investors and employees from different sectors and NGOs working on youth empowerment. Feel Free to check our invitationYoutube Link that Explains WHY the EcoLearn Summit is a MUST !! !